Some mornings on those rushed commutes, you really need to slow down and appreciate the views passing by. 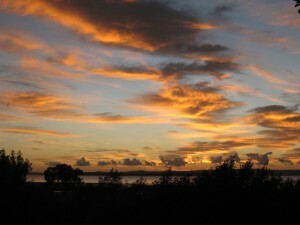 Hundreds of Sky Watch Friday Bloggers share their own views from all around the world. 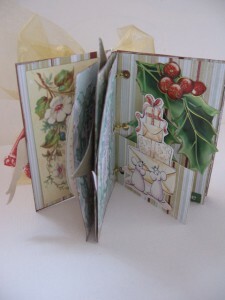 Itty Bitty books are a collection of ATCs bound up with a theme. This is part of a count down to Christmas project because after all we are almost half way to the next one! 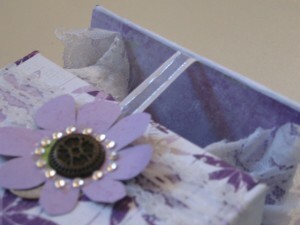 Sneak peeks, what do you think is popping out of this box? Am attending the next Kit & Caboodle event in Cleveland QLD, a full day with Tina McGonegal from Australian Simply Cards and Angella Peardon of 10 Second Studio, it is sure to be over the top kind of creative day. Sarah, of the Beach Cottage is hosting a Recession Misery Buster (RAK giveaway), check the link and see what she is posting this week. Always something fun going on there with tales of raising kids on the beach, settling into a new town or artfully reclaiming characters with good bones that make the beach cottage unique. Guaranteed to inspire with her recent addition of an on line mood board. Great colors and a beautiful sky. The fiery streaks in the sky are so beautiful! Lovely Photo..I love mornings…the first light..<br />You captured a beauty. One of the only nice things about getting older is that we are forced to slow down. The compliment to that it we see so much that we used to miss. So true. Especially when the morning presents a sky like this one. It’s beyond amazing. Wow, that is an awesome sunrise well done for capturing it so well. beautiful and dramatic. love the colors and texture. Glad you slowed down to catch this one! Love the gorgeous streaks of colour! Indeed, this view was worth slowing down for! That is a good reason to slow down and begin your day the right way. What a glorious skywatching you had there. Gorgeous! Love the colours. Just an excellent photo! Looks like flames shooting out from somewhere – gorgeous shot! gorgeous entry…love the rich colors in your capture.<br />have a wonderful weekend. When I start taking photos last year, I started to appreciate beauty in my surroundings…and most of the time, I always tried to find one. Gorgeous sky! Must have been breathtaking to be there. This sky is worth getting up early morning! Stunning! love those soft color clouds. coincidentally I have some clouds on my blog today too. Hope you have a splendid weekend! when you finish a polvore set and after you publish it , then you enlarge it by clicking on it , to the right you embed it to your blog by copying the codes , to put it into a post you would paste it to the HTML setting of the publishing window . From there you can copy the entire image to your photo or you can send it to yourself in an email. <br />Hope that helps . Lovely blog. Thanks for stopping by mine. Glad you took that photo and shared- Beautiful! The sky looks beautiful where you are. Sadly it is all grey here. Sky Watch Friday is such a cool idea though.